When joining for Basic Membership you will need to Register on this site. To join for or to renew your Full Membership please Login first. Then use the Profile tab on this site: then select either Join as a Full member or Renew Full Membership. This will lead you to a page where you can choose to either pay traditionally (which will lead you to the payment information below) or with Paypal. When you pay with PayPal (our account name is paypal@sl113.org), you can choose to do this using your own PayPal account, or using your credit card (without creating an account, see below). In either case, once your payment transaction is completed, your membership on this site will be activated immediately, and you can access restricted sections of the site, or check out past issues of Pagoda Notes. As an alternative you can mail your payment. Do note that check processing will require much more time to activate your membership. It is a manual process which we carry out very infrequently due to the small number of payments. Activation can take anywhere between 30-60 days. Prepare a check or money order payable at a US bank for the annual dues in the amount of US$35 (which includes the $5 handling fee) to the order of Pagoda SL Group, Inc. 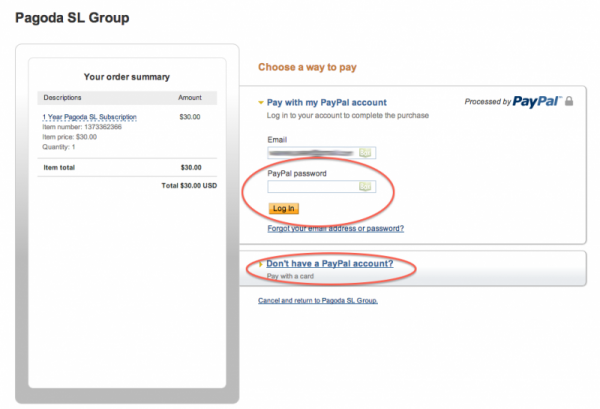 When you pay us using PayPal, note that you do not need to have a PayPal account. You can pay with a one off credit card transaction, without having to hold a balance with PayPal, and without opening an account with PayPal. Your credit card details are not stored by PayPal, and the Pagoda SL Group never even sees them. Just join or renew as decribed elsewhere, and press the Pay Now (with PayPal) button. The screen as shown below will open. Click on the Don't have a PayPal account? line. On the next screen you will get an entry form where you can add credit card details and approve a single payment to Pagoda SL Group. Visa, American Express and Mastercard are accepted.